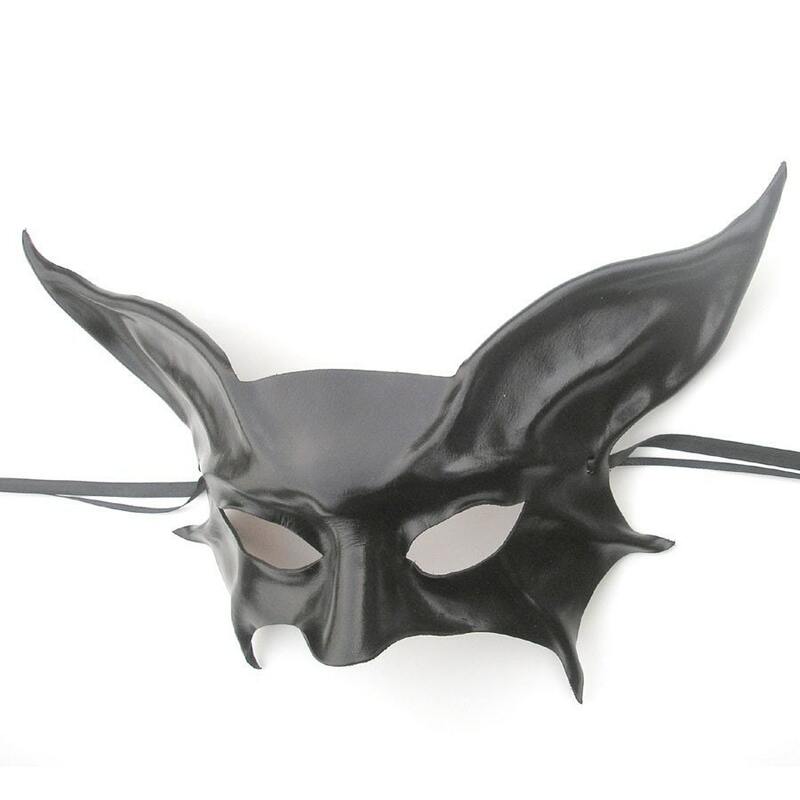 Teonova Leather Masks features the leatherwork of Caroline Guyer. 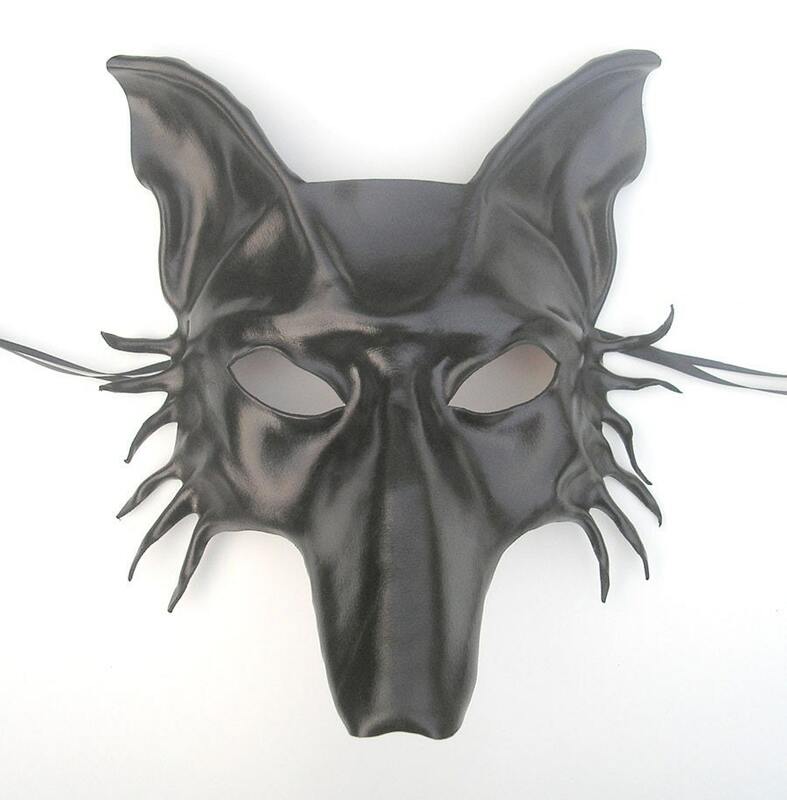 Masks are made of hand molded and hand formed leather, and designs range from the wildly freeform to more traditional designs like cats and wolves. Tell me about how you originally got into your craft, Caroline. I lived in a tourist town in Bucks County, PA that is home to a most excellent leather shop (Fred Eisen Leather), owned by master leatherworker Fred Eisen. A friend who worked there brought me home some leather scraps (this was in the late 1990's), and I ended up making my first mask. I was all excited about my new creation, and showed it off to Fred. He gave me some suggestions for a few improvements, and said he would give a go at selling them in his store if I made some more. Well, they started selling! I always jumped around from craft to craft, but I knew at that point that if I stuck to the masks, it could be my ticket to self-employment, which was a goal I had had as long as I can remember working. My best day right now is one spent hanging out with my man and some horses. I started horseback riding when I was about five, and it remains my favorite thing in the world to do. I teach riding one or two days a week, and am blessed to count as one of my closest friends a horse trainer who allows me the run of his stable of most excellent horses! Dressage is my thing, but I can't deny the thrill of an occasional jump or two. Or three. Yes, I have made masks for horses...very tolerant horses! And I am most fortunate that my boyfriend really enjoys hanging out with horses, too. I'm forty years old now, and just as obsessed as I was when I was a kid. Oh, I get so bogged down with the paperwork related to taxes! Sometimes I feel like I am drowning in it. But, it's usually not as bad as I build it up to be, once I actually tackle the tax-chores. All the different taxes can be confusing to understand at first, and keeping receipts and good records is a drag for me. But, it does seem to get easier each year as I learn the ropes, and I often read articles relating to self-employment taxes to help me keep abreast of any changes or tax-time tips and suggestions. 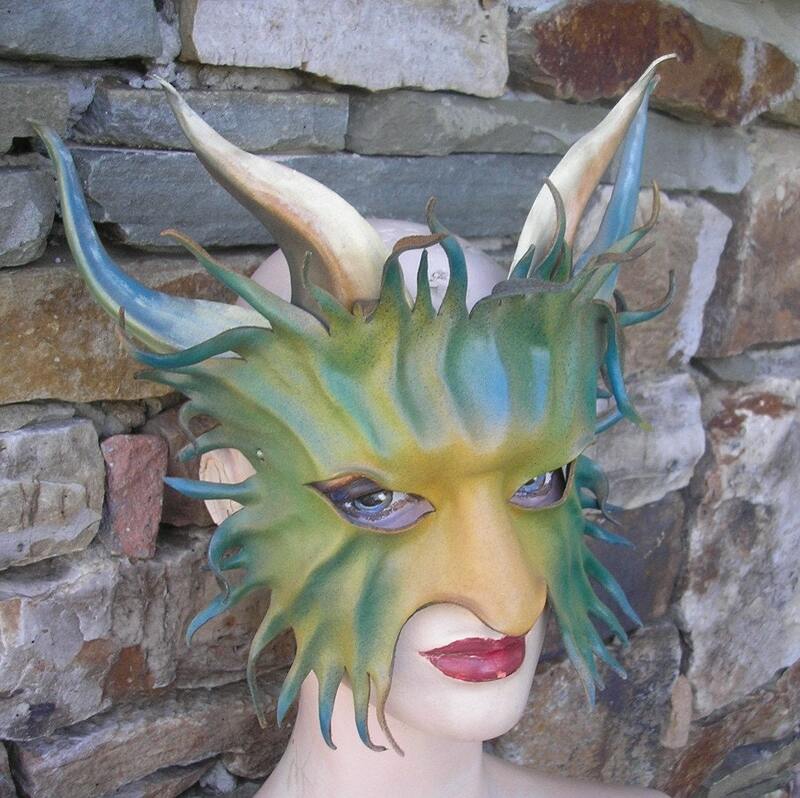 The mask that I would most like to have from my shop is the "Awesome Leather Mask of a Horned God or Beast...Forest Creature...Pan...Satyr...Greenman...Pagan...Goat..." I love how the shape and colors came out. It is one of the only masks I have ever done with two sets of horns, and it really worked out nicely on this piece. The main face part of the mask was made with a particularly wonderful leather hide I received from one of my suppliers...a hide that had superior characteristics for moldability. It was truly and joy to work with, and led to lots of inspiration and creative juice. I remember being in elementary school and a teacher passed around index cards and asked us to write down our names, and what we wanted to be when we grew up. I clearly remember writing "pirate". I also remember wanting to be a park ranger, an archaeologist, and a horse trainer. I feel blessed that I have been able to pursue one of those dreams to fruition (horse training). And, I clearly recall going to craft fairs when I was a kid and thinking that I wanted to have a craft, and make my living selling it at craft fairs. Well, here I am! I don't think I ever, ever would have guessed, though, that my craft would end up being leather mask making. But it has been great, and I am still enthralled anew with the medium every time I set to work. I just discovered this amazing shop on Etsy, called snegoratchka. My favorite piece in the shop is Ghost - Wearable Art. It is a copper mask modeled after the skull of a swamp sparrow - truly amazing! I am also really into supporting my mom's new Etsy shop, Specialdaygarters. She told me a couple of months ago that she had started making bridal garters, and I thought, okay mom, that's nice... But when I saw them in person, I was blown away by the quality and craftsmanship, as well as how pretty they are. I also love the great sleep masks at Freakyoldwoman and I hope to someday own a piece of beautiful pottery from Morrispottery. There are so many great artists on Etsy, and I have a pretty extensive "favorites" list. I could easily find a new artist to love every day, had I a bit more free time to Etsy-surf. Health and longevity, I hope. Also, I plan to pursue getting my masks into a couple more shops this year. Last year I tackled New Orleans, and you can now purchase my masks at Maskarade in the French Quarter. Next on the list are shops in Key West Florida, and St John or St Thomas in the U.S. Virgin Islands. I do love to travel! What I really hope the near future holds is to buy myself (by working hard now) some free time to make some really big, crazy fantasy masks...just some pure creative indulgence. And, I hope that my near future holds another really big custom mask order. I did a huge order a few years ago for a private party in Monaco, and would love to do another one. They gave me alot of design freedom, so it was both financially lucrative and creatively exciting. Yeah, another one of those deals would be awesome!